Buenos Aires has the oldest subway system in South America. the original line – – linea A – – was opened in 1918 and has been in continuous use ever since. They just updated that first line with the new subway cars, and I feel bad that I missed the original wooden cars and wooden seats that ran for over a century. 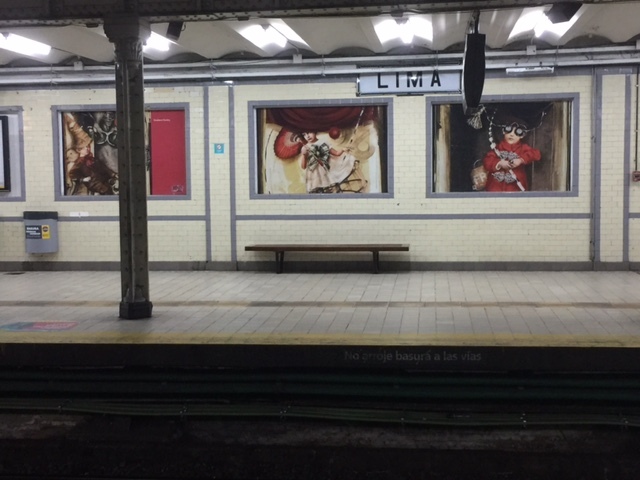 But a ride on the subway line is worth it; the stations are replete with original tiles and murals, elaborate railings, and are generally restored to the way they were when the subway opened. They are really quite spectacular. And, blissfully AIR CONDITIONED, at least on the newer cars. While I do miss the original wooden cars from Linea A that I so admired in the pictures, the new fancy cars are like ice-boxes. For me, it was heavenly. My SIL was freezing. I run hot and any amount of humidity beyond what I’m used to in Colorado makes me miserable. Not walking and sitting under the air vent was a welcome respite. Riding the subway is easy–just like any other city with a subway system, but there are a few complications. First, getting tickets. They don’t actually sell tickets to the subway, not any more. You can’t go to the station and buy a fare and board the train. 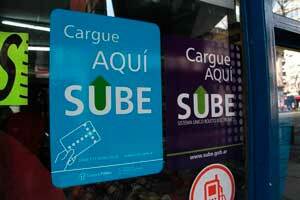 You need a SUBE card, a reloadable credit-card-sized pass that works on the subway, busses, and trains in the city. Sounds easy, right? Load the card, swipe at the turnstile, and you’re on your way. Not so easy. You cannot buy the card at the station (I have absolutely no idea why) and finding a place to get one can be a hassle. Most news kiosks can easily add funds to an already existing card, but finding and actual card to purchase can be a trial. The card costs $25A (about $1.50 USD), payable only in cash, and you can add up to $100 Argentinian Pesos on the card at a time. Which is plenty- a ride anywhere on the subway is $7.50. The website for the SUBTE has an interactive map to find a place to buy a card. Look for the icon of a hand+card, labeled Punto de Obtación. on the street, the shop or newsstand will have a large decal with SUBE on it. Many of the locations are out of cards, but can point you in the direction of the next shop. In my horrible Spanish, gesturing a card-sized rectangle and adding ‘puedo comprar SUBE tarjeta?’ Worked just fine. Early notes on the internet said that you need a passport to get a card. We were not asked for anything except cash. I think with the move to card-only, they dropped that requirement? Charging up the card is much easier. All subte stations have a window to reload the card and the card-readers and reload stations are everywhere. Find a kiosk with the reader (like an IDCard scanner), put your card against it and hand the clerk the amount of money you want added. Easy-peasy. You can even go in the hole up to $10, so you won’t ever be caught short and unable to get home. Rather bizarrely for such a large city, the subway stops running between at 11pm or so. After that, calling a taxi is the best option.